Rev. Simmons of Rome, Ga., visited our school Monday morning and conducted devotional exercises, after which he gave a talk of encouragement. Jeff Wood entered school Monday, and is boarding at the Shields House. 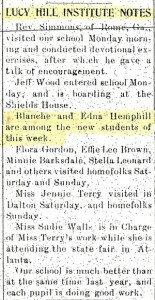 Blanche and Edna Hemphill are among the new students of this week. Flora Gordon, Effie Lee Brown, Minnie Barksdale, Stella Leonard and others visited homefolks Saturday and Sunday. Miss Jennie Terry visited in Dalton Saturday, and homefolks Sunday. Miss Sadie Walls is in Charge of Miss Terry’s work while she is attending the state fair in Atlanta. Our school is much better than at the same time last year, and each pupil is doing good work. A handwritten note on the page this clipping comes from indicates that it may be from 1906. The name of the newspaper is not on the clipping, but based on that date, it is probably from the Murray News. 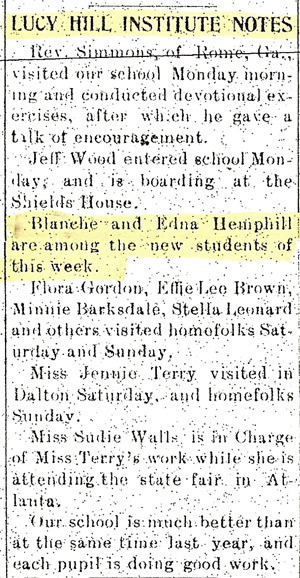 Source: Hemphill Scrapbook; privately held by D. H. Davis, [ADDRESS FOR PRIVATE USE,], D. H. Davis, “Lucy Hill Institute Notes,” undated clipping in unnamed newspaper, ca. 1906.